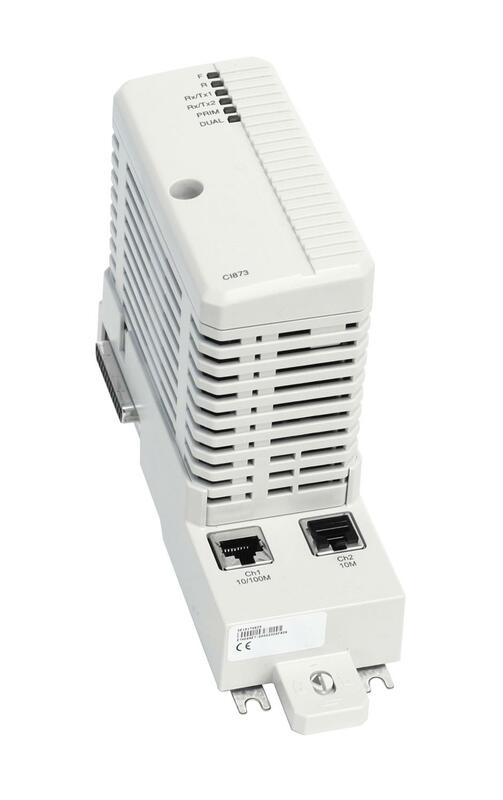 The CI873 is an AC 800M communication interface that connects to external Ethernet devices using the EtherNet/IP protocol. The TP867 Baseplate has two RJ45 Ethernet connectors, but only the CH1 connector that supports 100Mbps is used. The CI873 expansion unit contains the CEX-Bus logic, a communication unit, and a DC/DC converter that supplies the required voltage from +24 V supply through the CEX-Bus. The new S200CI873IoHwlib adds support for the S200 I/O adaptor 200-AENTR to be used with CI873. This new adaptor gives a simple and cost effective upgrade path for directly connected S200 I/O on SattCon 200, SattLine 200, Advant Controller 210, Advant Controller 250 and AC 800C. The 200-AENTR has two Ethernet ports with an in-built switch, which means that the adaptors can be daisy-chained to the CI873 using cross-wired Ethernet-cables without the need for external switches.